Among the hybrid ballpoint ink pens the Pentel Vicuna is a sneaky good option. For me, it ranks only behind the Uni-ball Jetstream and the Pilot Acroball, and it may have darker black ink than both of them. The Pentel Vicuna EX Multi Pen stepped up the Vicuna's game with an upgraded barrel to hold two ink cartridges (red and black) plus an 0.5 mm pencil. The three cartridge setup works well with the pen design. The barrel diameter is just big enough to fit everything and not have an overly large pen. In fact, it is just about the perfect size. Some multi pens get too wide or have cartridges that come out at a slight angle but that is not an issue with the Vicuna EX. As I anticipated, the ink cartridges are as smooth, solid, and vibrant as the single color pens. The black leaves a solid line and the red is sharp and bright (my photo makes it look duller than it actually is). The 0.5 mm pencil is a nice addition, and unlike many other multi pens it contains an eraser under the end of the cap. I won't be leaving my Jetstream's for the Vicuna anytime soon but it is a tougher decision than you would think. Maybe one day Pentel will see fit to bring them to the US. 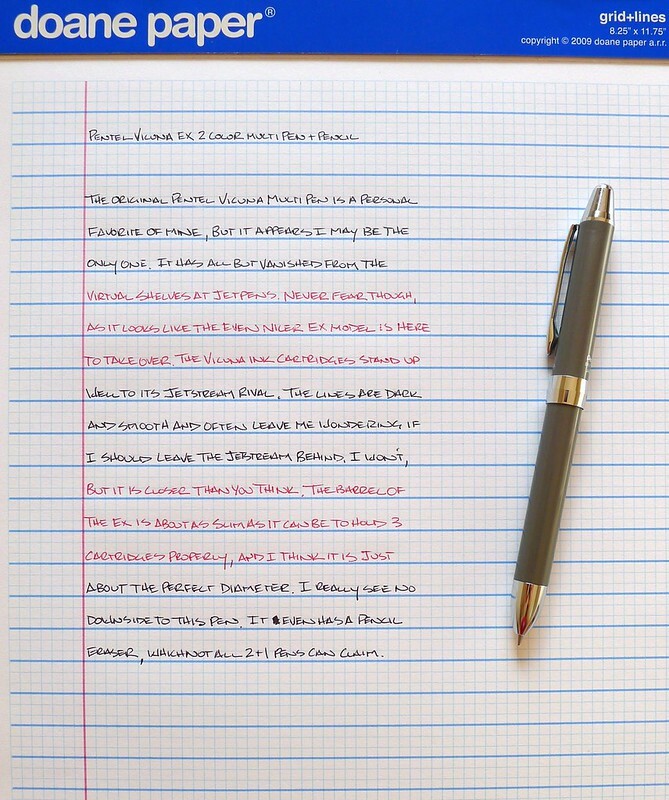 Posted on June 6, 2013 by Brad Dowdy and filed under Multi Pen, Pen Reviews, Pentel, Vicuna.